The Virtual Autopsy Table is a unique new medical visualization tool that allows people to explore the inside of a human body. With its intuitive gesture based interface, the Virtual Autopsy Table totally changes the way users interact with volumetric medical data. Multiple users can interact collaboratively and simultaneously, working with large and complex data to gain deeper understanding and insight into the functions and processes inside the body. The Virtual Autopsy is already utilized successfully to complement conventional autopsies. It dispenses with the need for invasive surgical procedures allowing medical experts to see things that would be difficult to discover with traditional methods. The technique is also used in other areas of traditional health care such as pre-surgery planning, other types of examination, education etc.The table can also, for educational purposes, be used in education environments and in public institutions such as museums, Science and Technology centers.The table is developed by RISE Interactive (formerly called Interactive Institute) in collaboration with Norrköping Visualization Center and Center for Medical Image Science and Visualization (CMIV) in Linköping, Sweden. 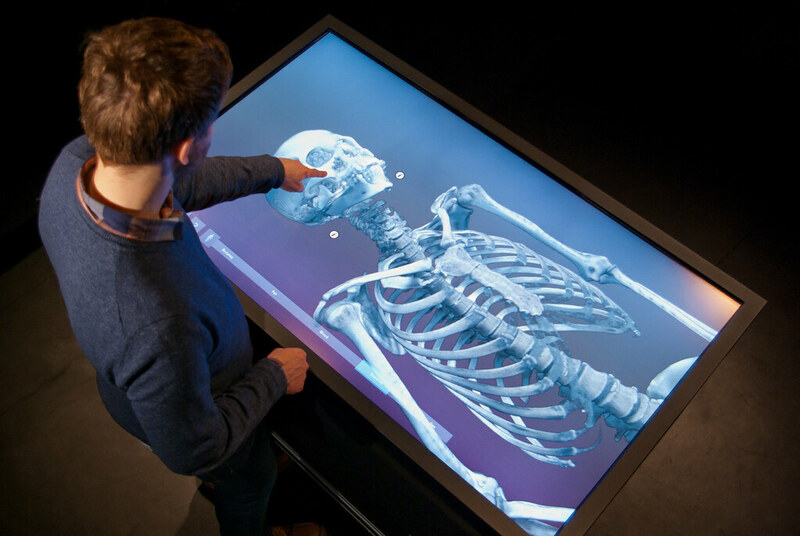 The Virtual Autopsy Table is now, under the name Inside Explorer, commercially available for museums, science centers and other type of public institutions. The Virtual Autopsy Table is now commercially available for the medical market through the medical technology company Sectra AB. Sectra develops and sells IT-systems and products for radiology, mammography and orthopaedic departments. More than 1,100 hospitals worldwide use the system daily, together performing over 52 million radiology examinations annually. This makes Sectra one of the world leading companies within systems for handling digital radiology images (PACS). The project is based on research results from CMIV, MIT at Linköping University, Sweden and Swedish National Board of Forensic Medicine. SVT Rapport, 16 november 2012. Rapport sänder ett nyhetsinslag om vår visualisering av mumien på British Museum, och den avslöjade mordgåtan. Se inslaget här (mellan 02:33-04:05): http://www.svtplay.se/video/585491/16-11-06-00 Inslaget finns tillgängligt till och med 23 november. Dagen Nyheter, 16 november 2012. Dagens Nyheter skriver om hur Interactive Institute och Norrköpings Visualiseringscenter C med hjälp av sin visualiseringsteknik avslöjat ett förhistoriskt mord. Läs artikeln här: 3D-teknik avslöjar förhistoriskt mord "Svensk teknologi har avslöjat ett 5.500 år gammalt mord i Egypten." – Det är kittlande med mordet. Men den nya teknologin innebär också helt nya vetenskapliga möjligheter, säger Daniel Antoine, forskare vid British Museum i London."